Adi Hutter says his Salzburg side have improved since their last Europa League meeting with Celtic and plan to become history makers in Glasgow on Thursday. The sides drew 2-2 in their Group D opener in September and are vying to finish top of the section. But no Austrian side has left Scotland with a victory in competitive European action after 13 attempts. 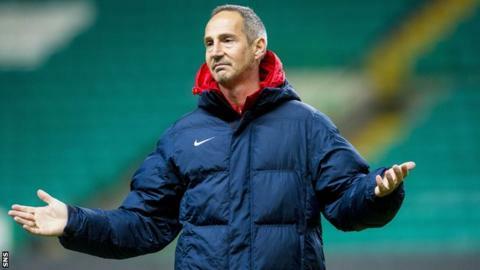 "We are prepared and want to become the first Austrian team to win in Scotland," said Salzburg coach Hutter. "We have come here to win the game, which would be important for the club and for me personally as it's my first season in the Europa League." "Celtic played a similar style to us in Salzburg, but our confidence wasn't so good in that match because we had lost our Champions League qualifier and two games in the league before that." Since drawing with Celtic in the Red Bull Arena, Salzburg have recorded three consecutive wins in the section, while they have also improved their domestic form to go top of their league. Hutter's side have already qualified for the last 32, but his side want to top the group to have a home tie in the second leg of the knock-out stage. "We've had nine wins in 12 games, so the confidence is high again," he said. "We have come here to win the game, which would be important for the club and for me personally as it's my first season in the Europa League. "I will enjoy the atmosphere, but I can only be happy if we play well and my team wins." Salzburg midfielder Kevin Kampl is also relishing the prospect of a big crowd and stressed that his side will be fully motivated despite having already qualified. "I am already greatly looking forward to the match and the atmosphere there," the Slovenia international told his club's website. "As we have already qualified for the round of 32, we are not under too much pressure. "We will give everything, though, to win the match and the group."